The aim of this paper is to provide the basis for the calibration of a hydrophone "in situ", thus assigning a value of uncertainty, which may be high, but according to requirements may be sufficient The aim of this paper is to provide the basis for the calibration of a hydrophone "in situ", thus assigning a value of uncertainty, which may be high, but according to requirements may be sufficient. Garcia-Benadí, A. [et al.]. 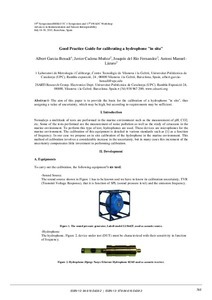 Good Practice Guide for calibrating a hydrophone "in situ". A: IMEKO TC 4. "19th IMEKO TC 4 Symposium Measurements of Electrical Quantities, 17th TC 4 Workshop IWADC on ADC and DAC Modeling and Testing". Barcelona: 2013, p. 16.